Guy W. Jones, Hunkpapa Lakota, is a full-blood member of the Standing Rock Sioux Nation. He is one of the founders of the Miami Valley Council for Native Americans in Dayton, Ohio, and has served as an advisor to the Cincinnati Museum of Natural History, the Minority Arts Task Force of the Ohio Arts Council, the Greater Dayton Christian Race Relations Task Force, and the Bias Review Council of the Ohio Department of Education. Winner of the Gustavus Myers Outstanding Book Award and Skipping Stones Honor Award. How do you help young children learn more about Native peopls than the cultural stereotypes found in children's books and in the media? 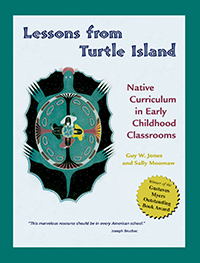 Lessons from Turtle Island is the first complete guide to exploring Native American issues with children. The authorsone Native, one white, both educatorsshow ways to incorporate authentic learning experiences about Native Americans into your curriculum.